Participants at a recent STJobs seminar were delighted to learn that increasing their productivity at work need not mean being glued to their desks and putting in long hours at work. Held on Monday, 25 Jun 2012, the one-day seminar saw renowned speakers Henry Toi, Thum Cheng Cheong, Tan Kwang Liang and Kirpal Singh Sidhu engaging participants in a series of topics to help them boost their productivity in an effective manner. Through various group discussions, activities and mind mapping sessions, participants learnt how to apply different techniques to different scenarios, when faced with ‘bumps in the road’ that may hinder their productivity. “Productivity is an idea that is often talked about, but is usually deemed to be a dry topic. 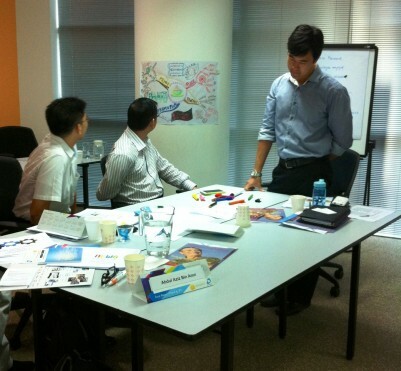 Thus I find that incorporating activities into the programme, besides hardcopy materials, is a good way of engaging participants,” says Henry, a Buzan Master Trainer and author of Habits of SUCCESS. Thum shares the same sentiments, and being a part-time lecturer with UniSIM, he knows this better than most people. “When participants actively involve themselves in any programme, they are able to retain more information than if they were to passively sit in and listen to the speakers. This in turn helps to increase their productivity,” he says. “There are various tools and methods one can use to improve his productivity. However, changing one’s mindset is ultimately the fastest and most permanent way,” adds Henry. Annie Chia and Ruth Tan, both Centre Managers at @27 Family Service Centre and Marine Parade Service Centre were pleased that they got a chance to attend the seminar. “Many of the concepts that were brought up are very relevant and applicable to what we do as social workers,” says Ruth. “The speakers are engaging, and I will definitely attend another seminar or workshop organised by STJobs. In fact, I’ll be attending one next month,” quipped Annie.